Fiasco In Islington, Part 2: Gilad Atzmon’s persecutor turns out to be an ultra-extremist Zio-terrorist! Turns out wasn’t just some ordinary Jewish bloke behind the “Blockhead ban.” Who’d a thunk it? Listen to Gilad discussing the “Blockhead ban” on my radio show. PS In case you missed it, check out Fiasco in Islington, Part 1 . The history of Herut and Likud tells us a great deal about who the people are who complained about Atzmon to Islington Town Council. When Atzmon moved to appeal his being banned, formidable opponents again appeared in the form of the Simkins Law firm, one of the most expensive law practices in Britain, with not one but two partners at Simkins being put on the case. These are Gideon Benaim and Tom Iverson. Benaim recently became well known in Britain for winning an invasion of privacy suit against the BBC on behalf of pop singer Cliff Richard, who said he spent ￡3.4m ($4.3 million) on the case. Clearly, representation by Simkins doesn’t come cheap. Also listed in Benaim’s resumé as a client is the Las Vegas Sands Corporation which likely has no problem with Simkins’ fees either. 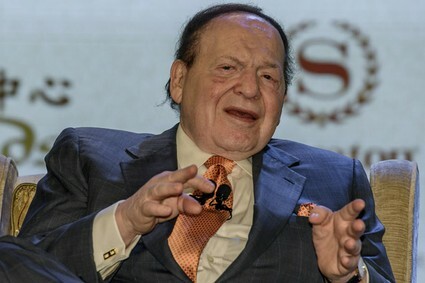 The Sands casino is owned by billionaire Sheldon Adelson, who, as it happens, is a primary sponsor of the Likud Party in Israel, led by Benjamin Netanyahu. Adelson owns the newspaper Israel Hayom, a mouthpiece for Netanyahu and Likud. It now appears that Atzmon’s banning was not the result of a casual complaint; it was an intentional attack on a well-respected supporter of Palestinian human rights by the Likud organization, directly represented by Martin Rankoff. The attack was followed up by the hiring of a lawyer who has worked for Likud godfather Sheldon Adelson. The connection to these powerful forces may explain why Islington Town Council leader Richard Watts, without any delay or attempt at negotiation, took the step of going straight to a decision to hire an expensive law firm. This is while Islington is facing serious austerity and shortage of funds in its own operating budget. Islington has a population of about 206,000 people. This very month, 43 of those people were counted in one survey as homeless and sleeping on the streets. Regarding the financial problems of his borough and others around London, Richard Watts, told The Independent in October 2018 that “unprecedented” funding pressure and demand for adult and children’s social care and homelessness services was “pushing councils to the limit”. According to Simkin’s web site, Gideon Benaim “has extensive expertise in the areas of defamation, privacy, harassment and copyright.” Perhaps it is not a coincidence that immediately after Islington brought in Simkins, identical statements from an unnamed Labour spokesman describing Atzmon as “a vile antisemite” appeared in both the BBC and The Guardian. Perhaps a lawyer experienced in defending people against defamation and harassment would also know how to perpetrate these things. Perhaps this was Benaim’s opening move. Character assassination is a common tactic in cases that have a weak legal foundation, such as this one, as it goes a long way to convicting the accused before their case ever reaches a courtroom. Previous articleExamination Faked? Did a Queens Podiatrist Help Donald Trump Avoid Vietnam? I hope Gilad can muster up some legal edge for this stalker. It sure seems as if he has some deranged sorts interfering with his ability to earn a living playing his music, performing at gigs. Plus all the libel in the letter the council received from dude about Gilad. Pity. Antisemite: Noun – A person the Zionists do not like. Maybe it’s time to get rid of Zionists like calling them in as Anti-Semites. Sounds like a start or get the Flat Facts of 911 out in the OPEN all across the planet. Thanks for updating on Gilad’s Travels. This is the pranked version of anti-dentight drama that goes no where. All Gilad wanted to do was play at a music festival, right? That started this????? WOW. JUST WOW. Too many questions / answers that I have, so without knowing much other than what I have read (and can remember) on VT in recent updates, I do have a ??? HUH ??? type observation to make. Did anyone bother to go to the police and press “STALKING” / “MENACING” charges against dude? That’s what I would have done. Observationally speaking [writing]. Those two are criminal charges, in nature. I don’t know the city codes, even if they have stalking / menacing at the jurisdictional level. The council sure seem like nice enough folk that just really, kinda, just, don’t want to get involved. The council lawyer advised them correctly. There may be other criminal charges, and/or civil charges that Gilad may have in his favor. I can think of a few from where I sit. But, not sure about other locals’ jurisprudence. I’m sure he’s been in touch with legal counsel. He could move on, and if the same thing happens again . . . They do realize Gilad’s born in Israel, or is a citizen, right? And, he’s Jewish, not religious. And LADIES . . . he plays the sax. All aside, I’m not sure how “anti-semite” Gilad can be found, legally, i.e., within the law, that he is someone that could possibly be anti-semite. Atzmon is a self-proclaimed ex-Jew (as well as a “Hebrew speaking Palestinian”), and a citizen of the UK.